NOW TAKING RESERVATIONS FOR the remainder of 2019, and for all of 2020.. DON'T WAIT! 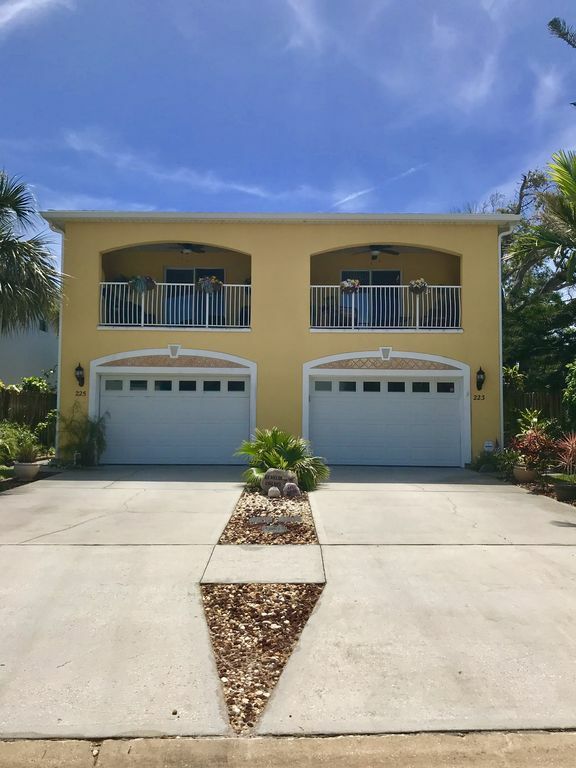 Don’t miss out on the most amazing place to stay on Cocoa Beach!! Be THE ONE who reserves it NOW!! Beroja Palms West has everything you'll need for a fabulous Florida vacation! ALL the amenities needed for fun in the sun! We provide beach towels/chairs/umbrellas/coolers/toys/etc., plus a propane gas BBQ grill, three bicycles, all linens, towels, dishes, etc. (We even have a high chair, pack 'n play, and "bumbo" seat for baby!!) Beroja Palms West is literally steps from the beach!! No constant ups-and-downs in a condo elevator!! So, why search any further?? This was the perfect location! Very close to the ocean! Within a short drive to the Florida theme parks! Close to golfing, boating, surfing, and all the other super fun things to do! The property was purchased in late 2005, construction began in January, 2006, and the doors opened on July 1, 2006! Granite countertops in the kitchen. Cherry cabinets. NEW Stainless Steel appliances! Flat-screen televisions in the living room and all bedrooms. WiFi available! BRAND NEW main floor luxury plank vinyl flooring! BEAUTIFUL and "BEACHY!!" There's a wonderful 'covered terrace' that overlooks the front of the property - a wonderful place to rest, relax, sip a beverage, and read a good book! The yard is beautifully landscaped, and the neighbors are excellent!! Indoor and outdoor luxury!! LITERALLY a three minute walk!!! Just steps away from the surf and sand! Parking is in the driveway only. Please park one car in front of the other. Do not try to park cars side-by-side. Gas grill, extra refrigerator, 3 bicycles, beach toys/umbrellas/chairs/coolers/etc. Beautiful cherry cabinets and granite countertops. There are flatscreen televisions in the living room as well as all three bedrooms. Cable provided through Bright House Network. Some available in the house! Beach toys for the little ones! Yes! We have a yard...filled with grass and beautiful flowers! TWO balconies, actually! One that overlooks the back yard, and the other that overlooks the front yard. 3 adult bikes. ONLY to be ridden on streets/sidewalks. NEVER to be ridden in the sand/ocean. Patio right off the living room. Enjoy the pool at the Cocoa Beach Country Club...open to the public! Very good place to enjoy the best Cape Canaveral has to offer. Andrea and Joe have thought of everything to make our visit truly comfortable and enjoyable. We have been vacationing regularly in this area for the past 12 years and their place is truly one of the nicest we have rented. Awesome time at a BEAUTIFUL HOUSE!!! OMG!!!! FABULOUS and FANTASTIC!!! Great place to stay before a cruise! We stayed here for one night before leaving for a cruise from Port Canaveral. We mainly wanted a condo versus a hotel to have easy access to a washer and dryer to get our laundry caught up before the cruise. We had been traveling for several days prior to this, and had been in hotels. The house was very nice, clean, and well kept. The nicest part was being able to find a place with no minimum night stay requirement, and reasonable rates. The condo is quite large, and our family of five had more than enough space to spread out. I did feel a little nervous with the kids in some parts of the house because they were breakables and décor arranged "just so", and I almost didn't want them touching things. Overall, I highly recommend this condo! I wish we would have gotten to experience the beach and pier, both of which are in close proximity, but we didn't have time. The home was very comfortable and clean. It was convenient to friends that we came to visit. It was really nice to just walk down the street to go to the beach. Enjoyed our visit. One of the very best VRBO stays we’ve ever had. A beautiful home, very clean and one that has everything you could possibly need for a great stay! This home was close to the Port where we picked up our son and his family after their cruise. We enjoyed the short walk to the beach, extremely convenient. The home was well stocked,the owners thought of everything. Cathy and Joe: SO glad that you enjoyed your stay at our Florida vacation home! We LOVE hearing wonderful comments from our clients!! Y’all were awesome tenants, and are, of course, welcome back ANYTIME! Happy New Year to you and yours!